You know the Indian women’s cricket has made a major breakthrough when the man in a suit thrusts a business card, introduces himself, and says, “Hi, I am Smriti Mandhana’s business manager!” We are in the national capital at an India Today’s Mind Rocks event, a celebration of youth power. 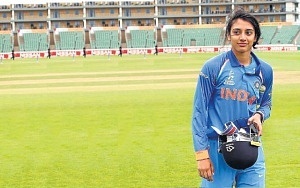 Lined up is a ‘star’ panel of women cricketers, including the shy 21-year-old from Sangli in Maharashtra. 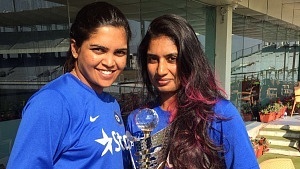 Smriti is joined by the ebullient Veda Krishnamurthy and Dr ‘J’ aka Jhulan Goswami, the ‘senior citizen’ of women’s cricket in the country, who has been affectionately nicknamed by her teammates. As we enter Siri Fort Auditorium, the crowd breaks out into raucous cheering. We could be in the presence of the much-loved men in blue, but here it’s the women who have taken center stage. When Krishnamurthy, with her blue tinted hair and spunky spirit, does a Hrithik Roshan-like jig, the audience chants her name. Virat’s star power has been replaced by Veda, if only momentarily. 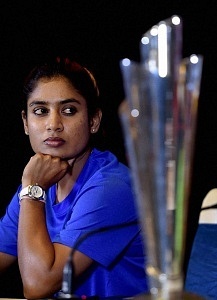 Cut to Chennai where a ‘wellness’ company has invited Mithali Raj, the Indian women’s team’s captain, to be a motivational speaker. Owing to her fractured foot, Raj is wheeled into the room, and the audience gives her a standing ovation. When she finishes her speech, a slew of selfie hunters gather around her. In 1983, Kapil Dev’s team stunned the world by beating the mighty West Indies. That one day in the Lords changed Indian cricket forever. That game was played in the nascent years of color television in the country, when India was still to unshackle the power of the marketplace; the women’s final was telecast live across the country in the age of 24×7 live satellite television where globalization is the new mantra. If 1983 made Kapil Dev a folk hero, the women too, have found their potential all-round ‘star’, also coincidentally from Chandigarh. Harmanpreet Kaur’s 171 run blitz against the title holders, Australia, in the World Cup semi finals was reminiscent of Dev’s great innings against Zimbabwe in the ’83 World Cup. Every six hit by Harmanpreet was lustily cheered. It brought our male-dominated newsroom to a halt, the realization slowly sinking in that this was a woman challenging every stereotype of women’s cricket. “She sure can hit the ball powerfully,” a colleague admitted grudgingly. It was almost as if with every stroke, Harmanpreet was smashing the glass ceiling that extended beyond the boundary. Almost four decades later, no one will ever try and put an Indian woman cricketer down again. The significance of what happened at the World Cup in England is that women’s cricket in India will now be finally taken seriously. While lifting the Cup would have been a huge bonus, the journey to the finals must be seen as Indian women’s cricket’s Chak De! moment, a real-life version of what our women hockey players achieved on-screen, and a milestone that should end decades of rank prejudice in the country’s most popular sport. For years, Indian women cricketers have suffered because cricket was seen as an exclusive male preserve. It isn’t just that The Women’s Cricket Association wasn’t recognized by the BCCI till 2006, or that the players were paid a pittance. The truth is, the entire system was ranged against the idea of women having an ‘equal’ right to play the game. To participate in the Women’s World Cup in in New Zealand in 1982, the team members had to cough up Rs 10,000 from their own pockets! While playing in the national championships, they were denied the right to play at the best grounds and often stayed in tin sheds and slept on the floor. Today, all that has dramatically changed. From being paid just Rs 1000 per day for a four-day match in the early 2000s, the players now have contracts that run into several lakhs. There is still a huge gap between the crorepati male cricketers and the women, but it is no longer a sport where the players have to struggle to chase their dreams. But, this isn’t just about the color of money. The rise of women’s cricket is a triumph of the democratic spirit, of breaking gender barriers, of rising above bias, of giving every Indian woman the right to hope. This, after all, is a country where women still have to fight for equal opportunity in public spaces, where women have had to hit the streets to demand stronger laws for protection, where sexual harassment at the workplace isn’t uncommon. But, when you watch a Mitali Raj or a Harmanpreet in action on the field, they are inspirational figures, hope-givers in an unequal society, role models for a more liberated, less chauvinistic society. In conversation, I ask Smriti if she is recognised on the street. “In Mumbai, maybe not, but in Sangli, yes. It’s difficult for me to go out without being surrounded by fans,” she replies with a hint of a smile. And what of Dr J, the world’s highest wicket taker in women’s ODI cricket? “Well, there is a biopic being made on my life,” Goswami reminds me triumphantly. “And I color my hair with a new shade before every major tournament,” pipes in the ever-enthusiastic Krishnamurthy. From personal business managers to biopics to colored hair, Indian women cricketers are now trailblazers. While the men may have their tattoos and fitness diets, the women have their distinctive styles as well. Post script: I finished writing my book Democracy’s XI in early July just before the women scored their big hit in England. If I had to write it all over again, my team would surely have a woman in the eleven, not so much as a token inclusion but a celebration of the fact that 70 years after independence, cricket is no longer a male bastion.